SHS is an in-home provider of non-medical services for seniors. We match active seniors who want to provide help with seniors who can use some services to maintain their independence and age in place. We started in 1998 with a simple concept that seniors can help each other age better and that those who give and those who receive benefit equally. It is our mission at Seniors Helping Seniors to assist seniors in our community of the South Bay and Westside of Los Angeles with aging in the comfort and safety of their own homes by providing them with exceptional high quality care. Since 1998, we have grown from our first match to working with hundreds of helpers and clients. We’ve continued to grow geographically. We also continue to expand the training for our caregivers. In addition, we’ve added services in response to the needs of our clients. 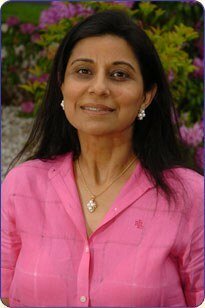 Seniors Helping Seniors in-home services was co-founded by Kiran and Philip Yocom created from Kiran Yocom’s personal mission to care for those who are unable to care for themselves. 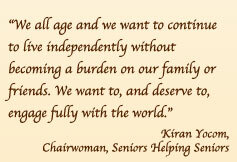 Before coming to the United States from India, Kiran worked with Mother Teresa for 14 years. Currently, Kiran serves as our organization’s Chairwoman, and Philip as the President/CEO of our organization. Our latest center addition is in the Southbay and Westside of Los Angeles run by Iman and Mohamed. 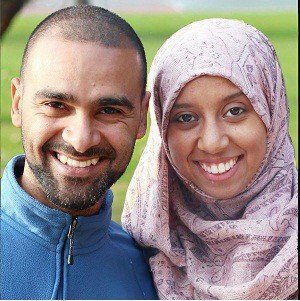 Their passion and experience in caring for the elderly led Iman and Mohamed to start a Seniors Helping Seniors center in West Los Angeles where they reside. They have long hoped to engage in social entrepreneurship and part take in supporting the cause of helping seniors age in the comfort of their homes. Iman and Mohamed both have previous experience in caring for seniors. Mohamed (along with his mom) cared for both his grandparents during their time of illness. He was responsible for taking them to their doctor appointments, feeding them, helping them with their mobility, and caring for their personal hygiene. Mohamed was also the caregiver for his dad who suffered from Parkinson’s disease as well as cancer later in his life, he lived with his dad until he passed away at the age of 78. He was also his mother’s caretaker for many years through a few surgeries and a knee replacement. Iman got her senior care experience from living with her grandmother for many years. She helped her with her day to day needs by taking her for walks, preparing her meals and helping in her mobility. In addition, while living in Ireland, Iman volunteered with her school to work in senior hospitals and living facilities. In total, she worked in three different senior care centers. Both Iman and Mohamed come from a culture where seniors live with their children or other family members, therefore, caring for seniors had always been part of their lives growing up. They also grew up in a family oriented environment where neighbors were considered extended family. Being active in the community and supporting family and neighbors was engrained in them from a young age.